This is Your Life! 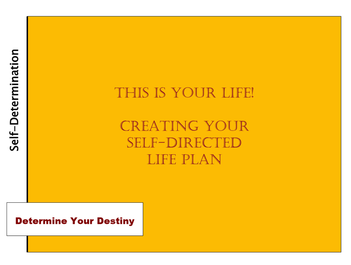 Creating Your Self-Directed Life Plan, is a workbook that helps people figure out what they’d like to do in life and how to get there. Some common goals are to manage a psychiatric or medical condition, get a job or a better job, go to school, find a better place to live, or develop a friendship. As they work through the guide, users learn to assess their resources and strengths, their needs, preparation to be undertaken, and action steps to meet goals. Using the Stages of Change model, users are guided through a planning process based on whether they’re contemplating change, preparing for change, ready to act, or wanting to maintain their progress. This workbook is for people in recovery from a mental illness or substance use disorder or who have found it hard to do certain things in life because of behavioral health issues. Other people have found the workbook to be useful as well, including people managing other disabilities, and transition-aged youth in the year before graduation. Many people with emotional problems feel like large parts of their lives are no longer their own. They may even feel like they have become their illness or diagnosis, and that few people see the other important and interesting things about them. Too often, people in mental health recovery face poor treatment and discrimination. If you feel like this, then this workbook may be for you. It can help you start believing that there really is more to life than your illness. You will learn that you can set a goal and reach it, even if you run into roadblocks. ​This is Your Life is a self-guided workbook, but it also has been successfully used in groups at psychiatric rehabilitation programs, community mental health centers, residential and inpatient facilities, high schools, and peer-led programs. It can be used anywhere that a person or a group wants to work on reaching feasible life goals, based on their readiness for change. Step One: Where Am I in the Change Process? A unique aspect of the workbook are planning pages that allow users to record the tasks that need to be accomplished to reach a goal, any obstacles to that goal, resources needed for goal attainment, and the target dates by which tasks will be completed, along with a budget for how much it will cost to reach the goal. The workbook is 53 pages long, including a number of worksheets for recording plans and tasks. It is written at a grade school reading level. It can be downloaded for free, and printed and bound for use. No experience is needed to use the workbook, although working knowledge of the Stages of Change model is helpful. 1. Read the whole workbook before writing down goals and tasks. 2. If using the workbook on your own, choose at least one person who will support you in this process. 3. Set aside time each day to go through the workbook, to make plans, and to review how you are doing. 4. Pick only one or two pages to work on at a time, especially at first. 5. Talk with your service providers and supporters about how this Life Plan fits with your treatment plan and other goals. 6. Recognize that life change is a process, not a one-time event. There will be starts and stops along the way.